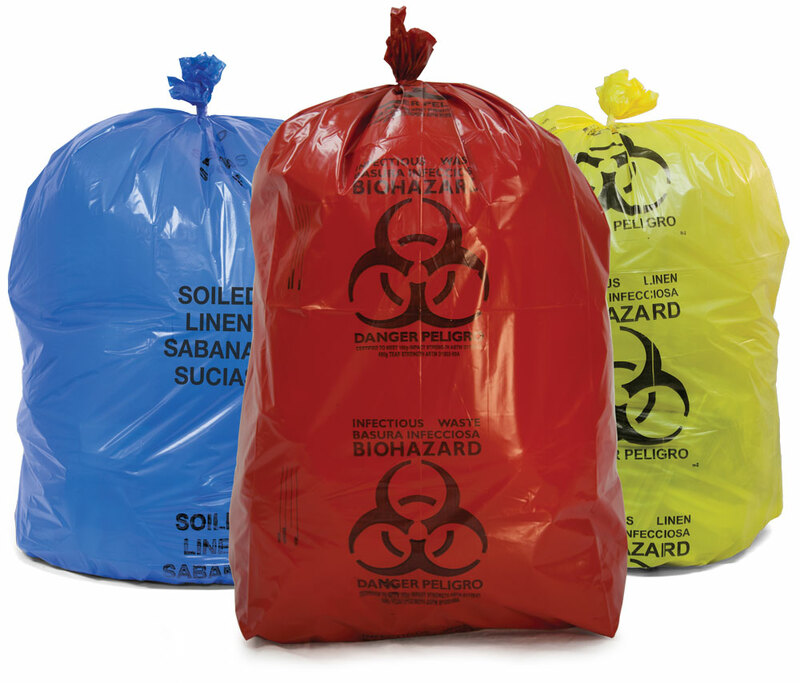 Our high-visibility Biohazardous Waste Bags are marked with the international biohazard symbol, or you can choose to custom print your own for you specific requirements. 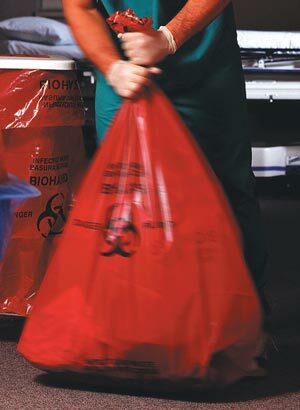 Our plastic Biohazard Bags alert others of the biohazardous waste contained within and ensures correct handling. Biohazardous Labels Biohazardous labels with either the words "Biohazardous Waste" or with a biohazard symbol and the word "Biohazard" (see Figure 1-1) must be placed on biohazardous waste containers. Figure 1-1. A biohazardous waste label with the biohazard symbol. Biohazardous bags must be either RED or clear (orange bags are not allowed) and labeled with either the words "Biohazardous Waste," or with a biohazard symbol and the word "Biohazard." These bags must be disposable and impervious to moisture, and have strength sufficient to preclude ripping, tearing, or bursting under normal conditions of usage and handling. Red biohazard bags must be used for Biohazard. - The production of biologicals. In some cases, researchers generate biological material which is then transferred offsite for regulated use. Incidental regulated use of the material offsite does not make the waste regulated. 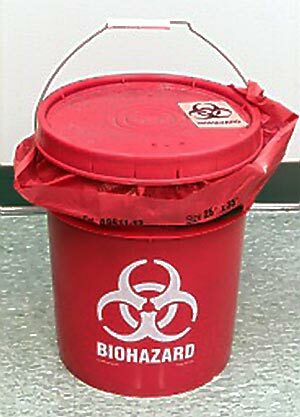 Red Biohazard bags are used to line all medical biohazard containers in laboratories where any regulated medical material is produced, and red bags are used to line all pickup containers provided by the disposal contractor. If a room uses red bags, the waste will be presumed to be regulated and must conform to the red-bag requirements listed after the flowchart. All biohazard bags in the room must be part of the Clear Biohazard Bag Program. Once a room switches to clear bags, the room must continue to use clear bags unless the research significantly changes. Generators are responsible for supplying their own bags. The bags must be clear or white and labeled with the biohazard symbol or wording. The bags do not need to be certified for autoclave use. Full bags must be tied or taped closed and disposed of in gray containers lined with red bags. Fill out the Accumulation Log with the wording unregulated lab waste. Lab containers may not be overfilled. 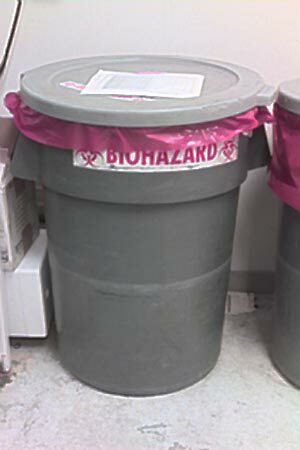 Containers must be labeled with the biohazard symbol or wording. 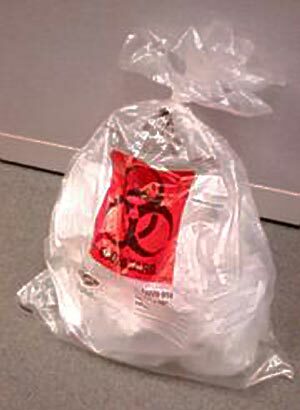 Dispose of clear bags when they are full or if there is a noxious odor. Weekly disposal is not necessary for clear bags. Benchtop containers lined with clear bags do not need to be covered. Larger containers lined with clear bags should be covered as a best-management practice. Sharps waste must continue to be accumulated in a sharps container labeled as unregulated sharps. These containers may not be overfilled. Only those generators notified by Waste Management that they qualify may participate in the clear-bag program. Clear biohazard bag Red biohazard bag. The color of a biohazardous bag is used to differentiate between waste that is regulated by DHS (red) and waste that is not (clear). The color of the bag does not indicate the level of biological risk or final treatment. All biohazard bags in the room must be Red Biohazard Bags. Generators are responsible for supplying their own bags. The bags must be red and labeled with the biohazard symbol or wording. The bags do not need to be certified for autoclave use. Full bags must be tied or taped closed and disposed of in gray containers lined with red bags. Dispose of red biohazard bags at least once a week. All containers, including benchtop containers, must be covered with a lid when not in use, and the lids must be cleaned once a week. 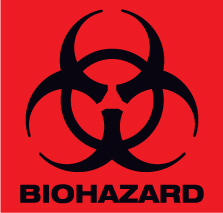 Containers, including benchtop containers, must be labeled with the biohazard symbol or wording. Sharps waste must be accumulated in a sharps container labeled with the biohazard symbol or wording. These containers may not be overfilled. Generators must take EHS 730, training for Medical/Biohazardous Waste Generators. 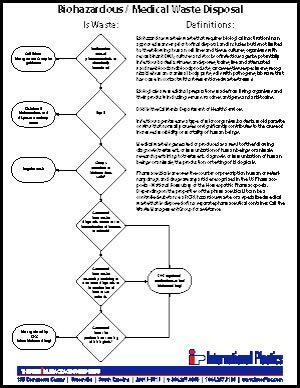 The following flowchart (Figure 1-4) shows the basis for clear-bag use for solid medical/biohazardous waste as well as disposal guidelines and definitions for biohazardous waste. Use this chart to determine if your laboratory biohazardous medical waste is regulated and must therefore be contained in a red bag. Biohazard containers (Figure 1-5) must be rigid and leakproof, with a tight-fitting lid, and preferable a footpedal to operate the lid. The containers may be any color, but they must be labeled with either "Biohazardous Waste," or with a biohazard symbol and the word "Biohazard." The labels must be placed on both the lid and the sides of the container. The labels must be visible from all sides of the container. In addition, biological materials of human origin that are covered by the OSHA Bloodborne Pathogen Standard must be placed in containers that are red or containers that have fluorescent orange or orange-red biohazard labels. Biohazardous waste containers must be lined with biohazardous waste bags before adding the material. The labels on the container must be visible once a biohazardous waste bag is added. There are biosafety reasons and regulatory requirements for maintaining lids in place on containers. In general, lids should be used to prevent the spread of potentially infectious agents or material. The lid should be kept closed on the container whenever material is not being actively added to the bag. At a minimum, the lid must be on the container during breaks, lunch, and at the end of each workday. Small countertop containers lined with clear bags (used for nonregulated biohazardous waste) can be used and kept uncovered. Larger containers lined with clear biohazard bags should be covered as a best-management practice. Biohazardous waste containers need to be placed in the laboratories near the point of medical/biohazardous waste generation. Medical/biohazardous waste must be segregated and physically separated from other wastes. Avoid, if possible, mixing medical/biohazardous waste with chemical or radioactive materials. Medical/biohazardous waste must be free from radioactive and chemical contamination to be classified and disposed of as medical waste. A biohazardous waste container. The following section describes the procedure that must be followed when transporting waste from laboratory medical/biohazardous waste containers to medical waste pickup containers. This includes moving medical/biohazardous waste more than a few feet within a room. c) washing hands after removing gloves. Seal the biohazard bag closed (tape, rubber band, etc.). 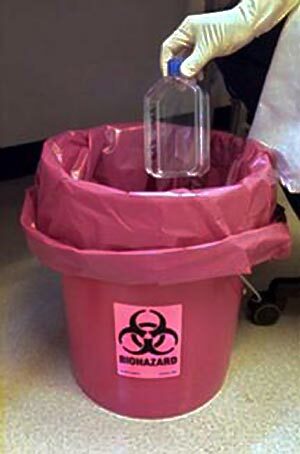 Carry the biohazard bag to the nearest medical waste pickup container (Figure 1-8). The biohazard bag must be secondarily contained during transport in a labeled biohazard container with a lid. This is a necessary precaution, should the bag leak. Remove the biohazard bag and deposit it into the pickup container. The pickup container must be lined with a red biohazard bag. Close the lid on the pickup container after adding the waste. Fill out the Medical Waste Accumulation Log which should be affixed to the lid of each gray pickup container. Note: Do not overfill the pickup containers. The lid must be able to fully close. Start a new one if necessary. Wash your hands after removing your gloves. Wear PPE when handling medical/ biohazardous waste. 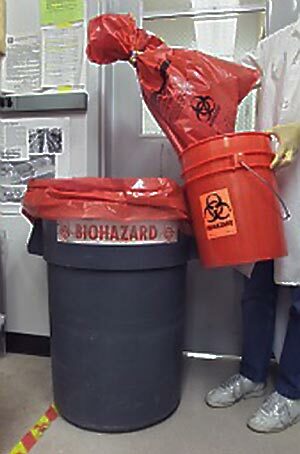 A sealed biohazard bag being carried to the nearest medical waste pickup container. Plastic Biohazard Healthcare Bags at Wholesale Prices!